As of three days ago, Megan has finally come to the stage of must-be-held-at-every-moment-or-cries-her-head-off-all-day-long. But, on the other hand, as of three days ago, she also came to a wonderful stage. It's the stage of cuddle-parents-very-often, for which we've been waiting a long time. Yeah. We like that one. I've been so preoccupied with things lately (yes, I do other things besides munch on Megan all day) that I almost forgot to blog about our 4th of July celebrations! On the 3rd, we got together with some of Jared's fam-damily for a BBQ at the Roberts'. It was incredibly delicious- ribs... mmm.... I tried to eat healthy but it just wasn't happenin'. Later that night, we went to watch fireworks. At first, Megan whimpered a bit from the noise, but after the fireworks Finale, she put on her own show. She was standing on Jared's lap, bouncing up and down, shaking her head like crazy, and squealing with delight. She did it for several minutes. It was ridiculously hilarious and she received quite an audience. Here's little Meggo all dressed up. Our little American Flag. It was a shame she wasn't smiling for the pictures. But, isn't she darling? This has nothing to do with the 4th, but every time Megan sees "Nana" (Jared's mom), she pushes Nana's face over so she can get to the earrings. The picture below is of Megan sucking intently on one of Nana's earrings. Since this picture, Nana has gotten smarter and usually takes off her earrings before picking up the Megster. On the actual 4th of July we didn't do anything special (except that Megan wore her 4th of July outfit to church and I know everyone thought she was the cutest thing in the world). On the 5th, we all decided to go to the Great Salt Lake and float. If you've never been there, it is quite an experience; an experience that I never want to experience again! Seriously. The lake has no outlet so the water just sits there getting murky. It was the most disgsusting water I've ever been in. I wouldn't have gone into the water, except for the fact that everyone else went in (including Megan) and I wasn't about to look like a party pooper. Confession: I h-a-t-e getting in "natural" water. If I can't see the bottom, it freaks me out. Plus, the thought of being surrounded by aquatic wildlife gives me the heebie-jeebies. 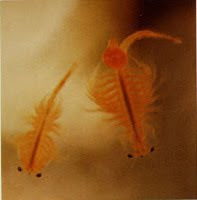 The water was full of brine shrimp (almost-microscopic little shrimpies) and I felt like they were all over my body, covering every inch and getting in my hair. I wanted to throw up. I very well could have thrown up and nobody would have noticed; the water was that gross. Plus, there were probably a zillion gnats everywhere. I shudder just thinking that I ever put my body in that mass of nastiness. While I was wallowing in self-pity for inflicting myself with unsubstantiated torture, I looked over at Megan. Megan had NO CLUE that she was swimming in pure filth. She was happy as a clam, splashing herself and her daddy into oblivion. Oh, to have the innocence of a child! No, that's not a swimsuit. She doesn't have one. What kind of mother an I anyway? After we got out of the water we took cold showers to rinse off all the shrimpies. Everyone was complaining about how cold they were. But, Megan? No complaints there! She was splashing in the freezing cold shower and having a blast! She sure taught me a thing or two that day. Megan rode her first buffalo! Megan got her first drink from a drinking fountain (she loved it)! Warning: this is a mushy-gushy, lovey-dovey, sentimental-type of blog post. Read at your own risk. I don't know why Megan being 9 months old today is such a big deal to me. Nine months- the amount of time I missed out on. Nine months- a crucial time in her existence that I couldn't be a part of. The only thing I regret is that I never got those first 9 months with her; that I didn't grow her myself. Now that she's 9 months old, I feel like I can have some claim on her (is that strange?). I just love Megan SOOOOOOOOOO much! Megan is such a darling girl. She's definitely the cutest little girl I've ever seen in my life, and she's the cutest girl you've ever seen, too (don't deny it). Not only is she adorable to look at, but she's such a well-tempered baby. As much work as she is, she's worth every second of whining, of crying, of feeding, of poopy hands, and of messy face. Her smile is contagious and her laugh brings sunshine with it. She does so many funny things I can't begin to list them all. Sometimes I wonder how different her personality might be had she not been adopted by us. Would she be just as happy being with her birthmom, or with some other family? Would her circumstances have made her a different baby? Would she smile as much, would she laugh as much? Would she be so predictable with her schedule? Would she still play well by herself? Would she still enjoy being social? I have to wonder if any of these things came from us. Nature vs. nurture. I'm sure some things would stay the same, but I'd like to think we've had some influence on important things such as her demeanor and personality. I don't know. Maybe as she grows up, we'll see ourselves in her, as all parents want to see. Right now it is hard to tell. I really can't believe that 9 months have passed. I look at her newborn pictures and it feels like we've only had her a few days. But, at the same time, it feels like we've had her forever. Where has the time gone? Have I wasted her time? Have I done everything I need to do? Have I nurtured her enough in these 9 months? I know nothing about being a parent, besides what my parents did & what I've seen other people do. I know I forget things all the time, and she'll probably get to kindergarten and her teacher will think, didn't this girl's mother teacher her anything?? I don't know when the right time is to teacher her to read, or to pottytrain her, or teach her colors, or teach her to count.... I'll figure it out as I go along. But I do know that I love her more than any other woman on this earth loves her. Is that enough? I rambled on forever in this post, and I apologize that I say the same things over and over (and over and over and over and over and over) again. I just love my gorgeous baby girl so much and I want everyone to know. I want her to know. I want to be the best mom, though I know I fall short. But, regardless of what I do or don't do, I'll always be her mom, and I guess that's what counts. Little Megan is so funny, and I want my parents to be able to see her in all her goofiness. Videos are the best way to do it, and since my parents aren't on Facebook, I'm re-posting them here on my blog. Embeding the videos from Facebook is the only way we can figure out how to get them on this blog. Therefore, every video on my blog will have been on FB first. Hence, you might see all these videos before they even make it on the blog (sorry, that makes for boring posts!). Furthermore, that was way too much explanation... let's get on to the fun stuff. This one is funny just by itself. However, I just have to say that Megan does this head-shaking thing at random times and it's very hard to get it on video. On the 3rd of July, while we were watching fireworks, Megan was doing the same thing as in this video- times ten. It was probably the funniest thing I've ever seen: she was shaking her head, screaming in delight, and bouncing up and down. I sure wished I had my camera with me at that time. If this video is any indication of what kind of teenager we're going to have, I think she's going to pay her own phone bill and live in a soundproof room. The video is kind of long; the first part is her making noise, and the second half is me making her "crawl" to the phone again. Enjoy! Mmmmmm yeah, I have the bestest (no, it's not a word but I'm using it anyway) husband ever! He called me from work to say he fixed my video problem on the blog (which I didn't even ask him to do... he gets extra kisses today). Yipee for having a computer genius for a husband! So if you still want to watch that video, just go to my last post and watch Megan in all her telephone-gettin' glory.